An air purifier humidifier combo is a great option if you want to clean the air and add a bit of humidity. Especially if you (or a loved one) is living with respiratory health issues. For example, even a slight change in humidity can amplify symptoms of COPD. Poor indoor air quality can also wreak havoc for people with allergies or asthma. Together, and air purifier and humidifier can help. But, if space is limited the best option might be a air purifier humidifier combo. Typically combining two products of any kind will introduce significant compromises. Remember when they used to build El Camino’s? That’s why we went out to create a guide that explains the ins… and outs of mixing purification and humidification. Sharp’s Plasma cluster isn’t the best humidifier, and it’s definitely not the best air purifier. However, this it does the best job of blending both into a single package. Others in this category tend to focus on humidifier duty first; and then add a “purifier” function after the fact. This unit takes the opposite approach. 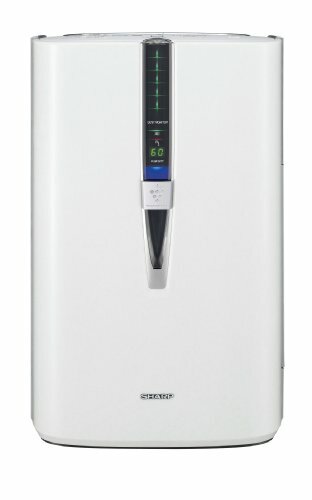 Sharp’s Plasmacluster features a solid purification system, built around a five year HEPA filter. The machine then adds a bit of humidified air into the mix to help make arid environments more livable. There are two PlasmaCluster variants that we detail in another article. To be quite honest we would buy two separate machines. A humidifier and air purifier combo will deliver more compromises than clean, moist air. It will either lean more toward a purifier… or a humidifier. If you have the space… you should get both. Plus you’ll get way more bang for your buck. An affordable top of the line air purifier like Austin’s Healthmate. They’re about the same price as the Plasmacluster and purify air much, much better. The Healthmate offers about 15 pounds of odor killing activated carbon and 60 square feet of medical-grade HEPA filter material. It’s also sized to handle rooms about three times larger than the Plasmacluster. From there we’d choose a quality humidifier to bring our entire home or apartment up to the desired relative humidity level. For around a hundred dollars you can probably find something that will work well enough to notice a difference. In fact, the Honeywell Quietcare we cover below would be a great choice to partner with an Austin Healthmate. It’s more of a humidifier than a purifier, and it’s good for 2000 square feet. And, if you’re on a tight budget swap out the Healthmate for Honeywell’s 50250-s. Ultimately the best air purifier humidifier combo is probably an air purifier AND humidifier. That is unless an all in one unit best suits your individual needs. Air purifier and humidifier combos (or separate units) can also help with less serious conditions. Each year millions of people deal with allergies brought on by airborne particles. The majority of individuals deal with seasonal allergies. However, keeping an air purifier protects your home from indoor plants, pets, dust, and other irritants all year long. A humidifier will help soothe your irritated eyes, nose and throat. If you use central heating, this features will help combat the dry air from your furnace throughout the winter. Many users find a dual air purifier and humidifier meets their needs better than either could alone. These tandem benefits help more than just chronic respiratory condition patients, though. Your house may benefit as much as you do. When humidity levels decrease, mucous membranes in your lungs, nose, and throat become irritated and less effective. Because these membranes work to protect your body from bacteria, viruses, and irritants, keeping them in working order is extremely important. While proper hydration is the main factor in membrane maintenance, the air you breathe also has an impact. Humidity also helps with skin health, your hair, and prevents dry lips. During the winter, humidity levels tend to fall. Heating your home will reduce those levels even more. On the flip side, cooling your home (or vehicle)in the summer will also dry out your air. In these cases, the best way to protect yourself is to introduce humidity through a humidifier. However, humidifier benefits extend beyond your health. Maintaining proper humidity extends the life of your home’s furniture, trim, and cabinets. You can easily find humidifiers and air purifiers as separate units, but you can save money and get rapid results by purchasing a combo product. We’ve reviewed some of the best available options for 2019 below. You can review features, customer sentiment, or skim over our summarized Pros and Cons lists. The Venta 2-in-1 air purifier and humidifier boast impressive humidification and air purification capabilities for rooms as large as 400 square feet. While it lacks a sleek design, it compensates with ease of use and reliability. 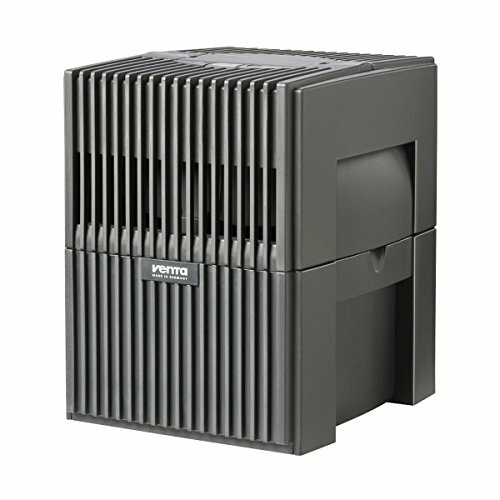 Encased in a boxy, and perhaps dated exterior, the Venta is engineered to clean the air without air filters or cartridges. Instead, the air it takes in passes over a series internal disks. The rotating disks’ moist surface traps impurities and pollen and then deposits the irritants into the water reservoir the machine uses to humidify the air. Since the particles cannot evaporate like the water, they are left behind in the tank. Most users comment on the unit’s ease of use. They also praise the filterless design and appreciate the cash they save. The unit is far from cheap, and a lot of users are underwhelmed with the unit’s quality. Some also voiced disappointment in the humidifier aspect of the product. It operates more slowly than stand-alone humidifiers. However, despite moderate criticism, most consumers are pleased with its performance. Honeywell is regarded as a world leader in high-quality yet affordable air purifiers. 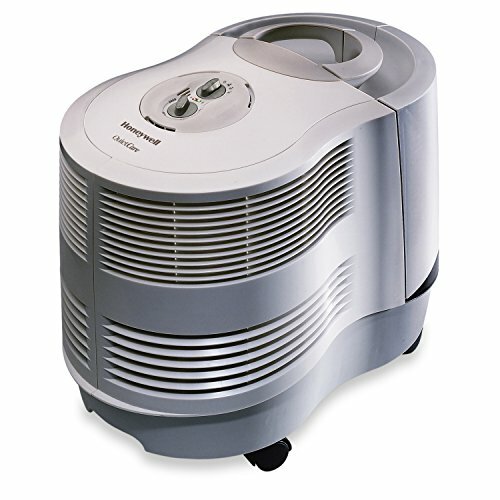 Their 6009 Quietcare Console Humidifier is a great option for people; who want to filter the air while adding humidity. This cool moisture humidifier is engineered to cover multiple rooms, or spaces as big as 2,000 square feet. While it does not have a HEPA filter, its “Air Washing Technology” is good enough to eliminate a variety of microbes, like bacteria, dust particles, and mold. Unlike the Venta unit, this model uses a filter and a wicking action to increase evaporation speed. The unit will humidify for up to 24 hours per tank-full. The HCM 6009 features adjustable humidity levels and a three-speed fan. The manufacturer claims it’s 30 percent quieter than the competition. Many users are surprised by the unit’s quiet operation, which is surprising considering how many square feet this device covers. Previous buyers also like the fact that it’s an evaporation humidifier, so there’s no worry about the dreaded white residue that mist humidifiers can leave on furniture or cabinets. However, a few users said they noticed a subtle rumbling noise during operation. Overall, this is probably the most widely-used unit on our list. It is very competitively priced, and despite the low cost, it’s a very powerful and effective unit. The Sharp KC-860U not only cleans the air but also cools it. The unit features Plasmacluster technology to remove dust, pollutants, and pet dander. It also uses activated carbon to absorb odor. The Sharp KC-860U can clean the air in areas measuring 347 square feet.Sharp designed it to operate quietly at any fan speed. The unit also comes with a True HEPA filter, which helps reduce allergens and other respiratory concerns. Unlike other products, true HEPA filters are known to last longer, depending of course on how often you use the air purifier. In order to make sure that the unit runs effectively, you must check filters frequently. This is one of the highest priced units on our list. Customers really like the quality and performance of these units. They also seem to be willing to part with a sizeable amount of cash to get HEPA filtration and humidification in a single package. They praised the odor-removing activated carbon in the unit. However, the most common complaint regarded substandard customer service. If you suffer from chronic respiratory illness or seasonal allergies, you should consider improving indoor air quality with a combined air purifier and humidifier. Even if you only want to protect your home’s wooden furniture, we recommend looking into these products. While many stand-alone units are widely available we love the ease of an all-in-one solution. Of the products listed above, the best overall product appears to be either the Plasmacluster or the Dreval D-850. Not only do they offer the most air purification technology, but they both have some of the best feedback across the board. Customer service is a repeated issue for these products, which is why it’s so important to thoroughly research before making a purchase. Hopefully, this guide will help you make the best decision for your home and health. A machine that humidifies and dehumidifies sounds like a product that should exist, right? However, we haven’t seen anything on the market that with that capability. Or at least we haven’t seen anything that works the way we imagine a humidifier and dehumidifier combo should. Unfortunately a lot of websites either unknowingly group in a purifier and humidifier machine into a list of supposed machines that humidify and dehumidify. We aren’t going to comment on whether that’s a bit deceptive or just due to a lack of understanding. However, we will say that the best humidifier and dehumidifier combo is a pairing of two stand-alone machines. You can read more about our favorite dehumidifiers here. Or check out a handful of humidifier options in this post. And, if you want a machine that’s mostly purifier with just a bit of humidification built in… check out our guide to air purifier humidifier combo machines. The Dreval D-850 features a high-efficiency HEPA filter along with UV light and an ionizer to reduce the maximum amount of allergens and contaminants. An activated carbon filter removes odors as they pass through the unit. As the name suggests, there are seven filtration steps in all. The system has optional humidifying settings, and a remote control allows users to adjust fan speed from any part of the room. Sleep settings turn off the unit’s lights and reduce the already low fan noise. Overall, previous buyers loved their Dreval D-950. Some users did note the unit grew a little louder with age. A handful of users did not realize they were purchasing a machine with a built-in humidifier and had difficulties later with customer service. The only other complaint was that the machine could use a larger water reservoir. Previous buyers with serious respiratory concerns saw an improvement in their symptoms and left glowing praise for this unit.